Optimus Prime, Bumblebee, and their friends must unite every Cybertronian, Earthling, and ally they have to stand against this threat to all existence. But why is Unicron hellbent on destroying Cybertron--what original sin did Optimus Prime's ancestors commit to earn this wrath? It's an all-out battle against extinction as the world-destroying, universe-shattering threat of Unicron comes to destroy everything. Collects the complete six issue series Transformers- Unicron. Start reading Transformers: Unicron on your Kindle in under a minute. The end is nigh! Unicron, a planet-sized being that devours other worlds, has set its sights on Cybertron and all of its colonies--including Earth! The IDW Transformers that John Barber wrote and edited took a sorry turn for the worse with the Revolution event, when MASK, ROM, GI Joe and other toys/comics from the 80s were added to the Transformers universe. Comic crossovers are usually never about improving stories - rather, they are a way to boost the sales of sagging comics. The Revolution event was horrendous, and the books were near unreadable. This conclusion to IDW's 13-year Transformers run is the spiritual descendant of the Revolution event. While most of this book focuses on the Transformers (specifically, those of the RID and Optimus Prime series), there are several 3-4 page snippets from GI Joe, Rom, MASK, Visionaries (WTF are they? ), and one or two other groups. Really really bad. After reading the first few, I just ignored the rest and the story lost nothing. Their presence was jarring. The main theme of this story is that Unicron attacks and everything in the Transformers universe is in peril, particularly Cybertron and Earth. 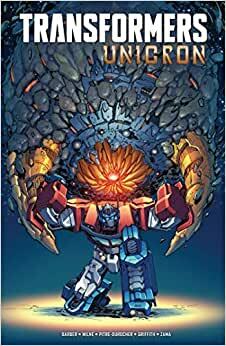 This book conflicts with the end of the Lost Light series (which is among my three favorite endings to a series ever). Since IDW was ending this Transformers run and restarting it all anew, they could have taken an aggressive and original stance on how it could conclude. They didn't. Many of you can predict the ending. That is not why we read. There are too many characters for the brevity of pages. It is clear that Barber enjoys writing Starscream and Optimus Prime, but he does a nice job using Windblade to criticize them and the Cybertronian race. We also have nice appearances of Shockwave, Arcee and Prowl, whom were all hugely featured during Barber's run. With the run over, the book was at it's best when Prowl and Starscream took center stage.